Jean-Michel Rabaté has been a professor of English and Comparative Literature at the University of Pennsylvania since 1992. He is a managing editor of the Journal of Modern Literature and a senior curator of Slought Foundation. He has authored or edited more than twenty books on Modernism, literary theory, psychoanalysis and contemporary art. Recent titles include: The Future of Theory (2002); Ed. The Cambridge Companion to Jacques Lacan (2003), The Palgrave Guide to Joyce Studies (2004), Logiques du Mensonge (2005), and 1913 (forthcoming). This exciting new study investigates links between avant-garde art and the aesthetics of crime in order to bridge the gap between high modernism and mass culture, as emblematized by tabloid reports of unsolved crimes. Throughout Jean-Michel Rabate is concerned with two key questions: what is it that we enjoy when we read murder stories? and what has modern art to say about murder? Indeed, Rabate compels us to consider whether art itself is a form of murder. … The book begins with Marcel Duchamp’s fascination for trivia and found objects conjoined with his iconoclasm as an anti-artist. The visual parallels between the naked woman at the centre of his final work, ‘Etant Donnés’, and a young woman who had been murdered in Los Angeles in January 1947, provides the specific point of departure. Steven Hodel’s recent book has thrown new light on what was called the 'Black Dahlia' murder by pointing to one of Duchamp’s friends, Man Ray, who, according to Hodel, was the murderer’s inspirator. This putative involvement recalls Walter Benjamin’s description of Eugene Atget’s famous photographs of deserted Paris streets as presenting ‘the scene of the crime’. Indeed, this phrase was used as the title for Ralph Roff’s 1997 exhibition, which implied that modern art is indissociable from forensic gaze and a detective’s outlook, a view first advanced by Edgar Allan Poe who invoked both criminal detection and manuscript studies in his 1846 essay ‘Philosophy of Composition’. Arguing that Poe’s fanciful account of the genesis of his story ‘The Raven’ can be superimposed onto his deft solving of murders like that of the ‘Rue Morgue’ or of Marie Roget, the author goes on to suggest that Poe’s aesthetic parallels Thomas De Quincey’s contemporaneous essay ‘Of Murder Considered as one of the Fine Arts’. 3 Scene of the Crime: Nothing to see! 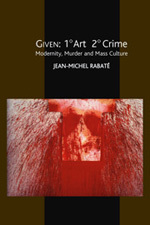 Recommended for faculty and graduate students, Jean-Michel Rabaté’s Given, 1º Art 2º Crime is a study that aims to link avant-garde art to the aesthetics of murder in order to bridge the gap between modernism and mass culture, where the latter is often embodied by both popular best-selling novels and tabloid coverage of unsolved murder cases. As such, it might be more accurate to think of Rabaté’s study as Given, 1º Murder, 2º Art. That is, he premises his argument on Thomas De Quincey’s contention that murder can be considered one of the fine arts, if one separates the aesthetic from the moral. This separation of ethics and aesthetics is permissible if the murder has already been committed, whereby it ought to be treated as an aesthetic spectacle to be enjoyed. However, how we enjoy the aesthetics of murder has changed over time. Instead of basking in the sublime aura of masterpieces, Rabaté argues that we now reduce this aura into a network of clues and traces. In doing so, we need to turn into skilled detectives in order to discover the hidden clues left in the body of evidence. Yet this extends beyond the idea of critic-as-detective and into the realm of paranoia. In other words, what is new about Rabaté’s assertion is the idea of critic as paranoid criminal-detective. Like the basic law of the genre of detective stories, everyone has to be suspected (p. 80) by a critic who is ready to become criminal (p. 13) through the offering of transgressive interpretations of works of art. Even when there are no obvious traces to be found in the work of art, the critic can always hallucinate them into being through the use of paranoia-criticism (p. 121). who cross the bridges linking the history of the avant-garde and the esthetics of murder’ (5).